Move on over Waffle House, Roscoes Chicken & Waffles, Ihop, Eggo and everybody else! Here comes MY MAMA’S WAFFLES!!! They are…how can I say this….the BEST!! I might be a tad bit biased here but…ok nope I’m not! They really are the best! : ) They freeze and reheat well too! 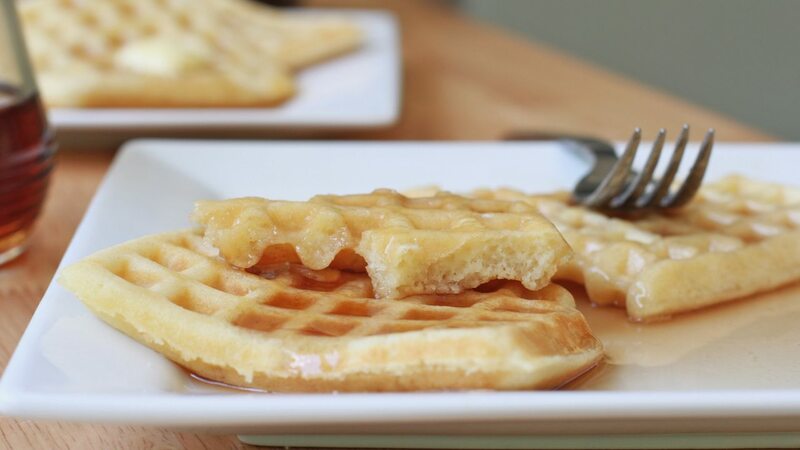 My mommy always made the best waffles and I’ve tweaked her recipe very slightly to make these buttermilk waffles even better, if that’s even possible! 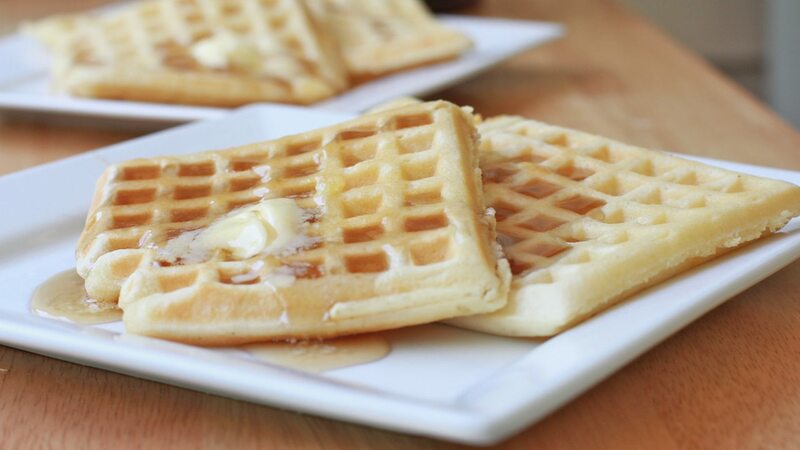 Actually they remind me so much of Roscoe’s waffles. Every time we visit California the first place we stop to eat is at Roscoe’s Chicken & Waffles! 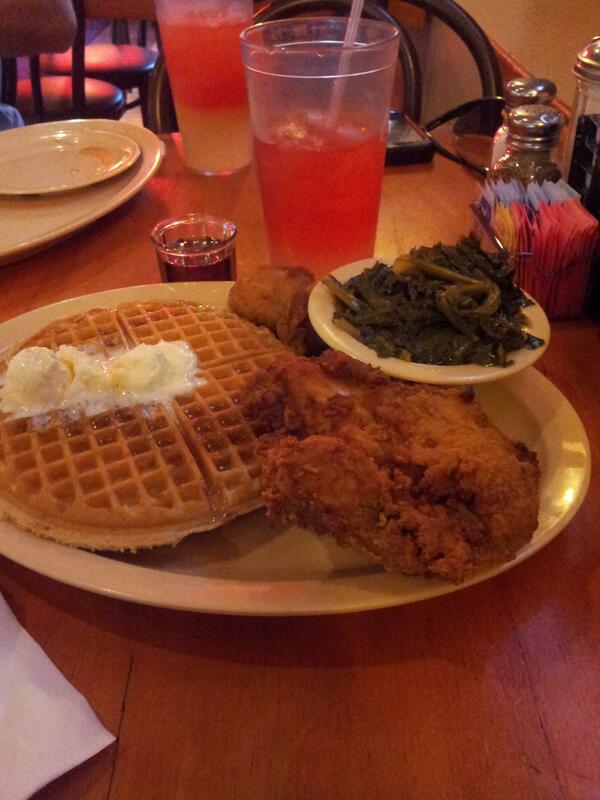 I always order a sunrise drink, waffles, chicken wings, collard greens and macaroni and cheese, YES GAWD!!!!! Just thinking about it makes me so happy! I made spicy fried chicken and waffles for dinner last night (for the first time ever) and it was UH-MAY-ZING! Why is this combination so good? I think one of the reasons why I love Roscoe’s waffles so much is because they remind me of those old school waffles I grew up eating. Not those belgium waffles. One taste of these babies and it’s like I’m back in mom’s kitchen on a Saturday morning! She’d be blasting gospel music, usually that “I don’t want no peanut butter and jelly” song. At the same time she’d be dancing and cooking those old fashioned, homemade buttermilk waffles in that old, heavy waffle maker that occasionally left little traces of black specs from the waffle iron. They were thin, golden and slightly crisp on the outside yet soft and fluffy on the inside. I could eat them plain or even sprinkle with a bit of powdered sugar (helloo breakfast funnel cakes!). We’d load them with whipped cinnamon butter and then pile on the syrup! 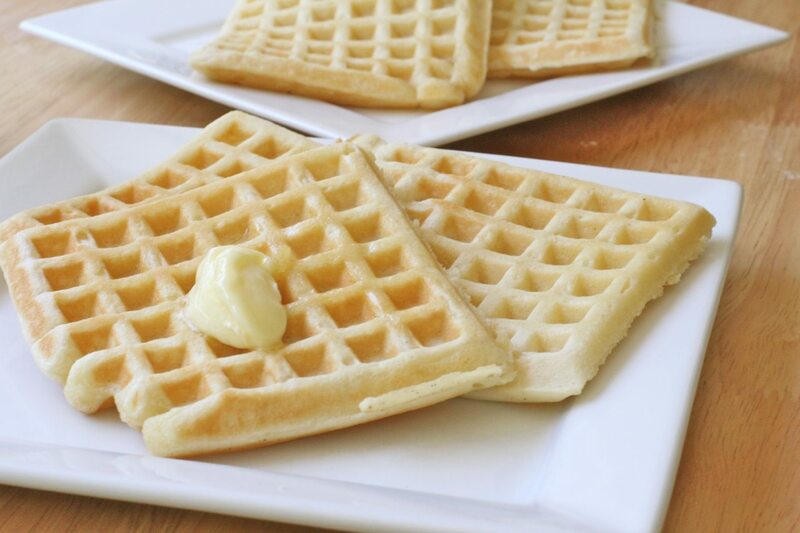 I usually only make this homemade buttermilk waffle recipe whenever we have company because they are a tad bit more involved than my normal weekday waffle recipe. But every time I make them I vow to never make my old recipe again. They are SO WORTH the few extra steps. Seriously, make these buttermilk waffles! Your family will love them and you might just love me too after eating them. Watch me make these homemade buttermilk waffles from start to finish! Make a well in the center of the bowl. Add the milk, buttermilk, egg yolks, butter, oil and vanilla extract to the center of the well. Gently fold the flour mixture into the wet mixture until flour is combined. Do not over stir. Fold in stiffened egg whites and stir very gently until egg whites are mixed in. Let batter rest while the waffle iron is heating up. When waffle iron is ready add a cup of batter (may need more or less depending on your waffle iron) to the hot griddle. Spread batter out a little if desired. 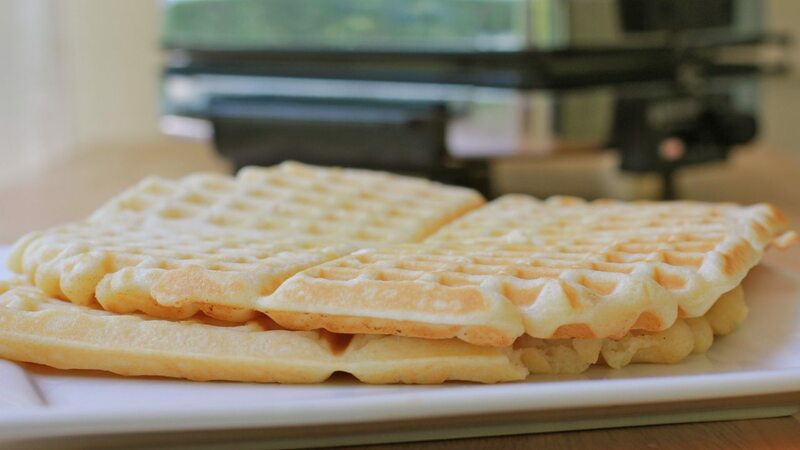 Place waffles on a cookie sheet or tray and brush with butter. Do not stack waffles on top of each other if you want the outsides to stay crisp. 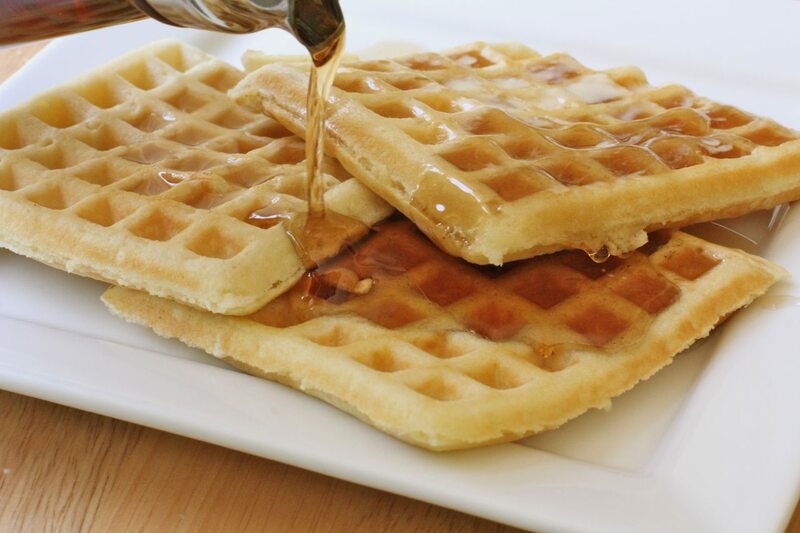 Top waffles with creamed butter and drizzle with hot syrup. I’m gonna try these as soon as I get a waffle Iron!! When you have time please update your blog with that homemade syrup. I can’t wait to try it. Love your recipes!! Thanks for sharing! Hi! It looks delicious! I wanna try it but I don’t have a waffle Iron (it isn’t very common here in Argentina). Can I do it in a griddle? OMG!!!!!!! Just made these. And you are right, they are UGH-MAY-ZING!!! Best I’ve ever had. My daughter loved them too.. I love you Monique, you truly have a gift. And thanks for sharing it with the world. 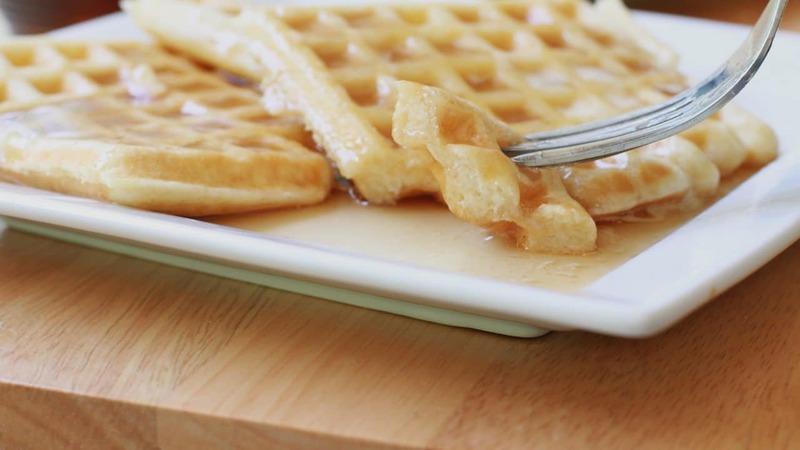 Thanks for sharing your thoughts on buttermilk waffles recipe. 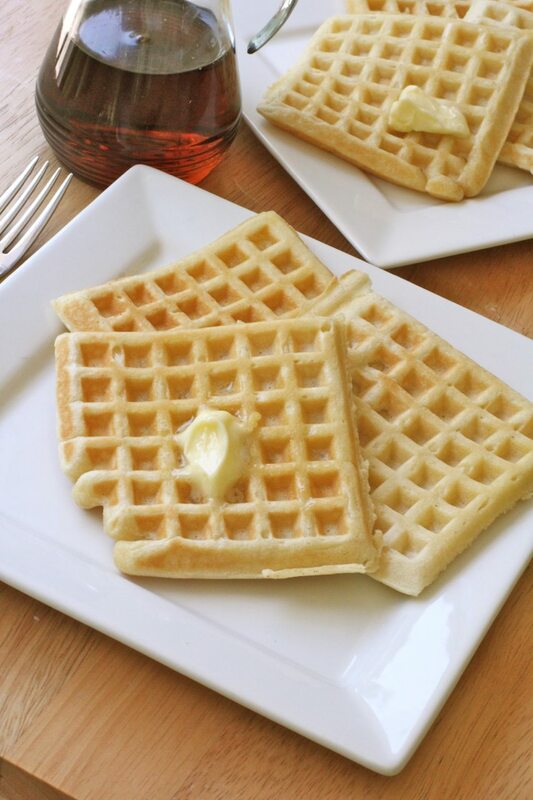 I just love love your blog, I think the videos are amazing and I have tried a few of your recipes and they came out delish…..
Do you have to grease the waffle iron before you put the batter in or not? this is looking very delicious. good tips to made this at home. Can you post the link for the waffle maker? When I search all I can find is Belgian waffle makers! Thanks Luv!